Throwing a party on a bus is not a new concept; doing it for all ages is. Whether you’re planning a birthday party for a group of six-year-olds, a friend who’s turning 21 or a family member who’s celebrating her 60th, you can rent a chartered bus for an afternoon or an evening and make the event one that your guest of honor will never forget. Young children may enjoy going for a bus ride to a theme park or family-fun arcade for a friend’s birthday. Especially for children, riding a bus to their destination makes getting there half the fun. 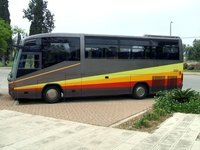 Most chartered buses are equipped with a DVD and video system so you can play movies, or even hook up a karaoke system to the bus’s PA system and allow the birthday boy or girl to perform a song for the passengers. Invite a clown aboard to blow balloons, sing songs and lead the children in fun activities. Some cities feature buses filled with video games, food and even a dance floor which can be transported to any location (such as a home or neighborhood park), set up and enjoyed by up to 20 children. Renting a bus to your local children’s museum is convenient and provides space for many children, and a few of their parents, to attend without having to drive multiple cars or deal with potentially painful parking situations. Let a chartered bus take you and your just-turned-of-age friends around the town to party safely. Rent a bus for the evening and tour your local bars and nightclubs. Surprise guests with a stash of glow sticks and beverages on board. Many chartered buses will allow alcohol on the bus if all guests are of age, so make the driving just as fun as the dancing with a few drinking games and singing contests. If you’re throwing a party for a friend who loves sports, charter a bus to his favorite sporting event and set up in the parking lot for a tailgate a few hours before the contest begins. The outside of a party bus may look plain, but inside, many buses feature comfortable sofa-like seating, nightclub-style lighting, quality sound systems and big-screen televisions, which make the experience anything but ordinary. Incorporate a bus into your plans for a special 60th birthday party. Choose a theme and have guests dress the part. Gangsters, medieval, roaring 20s or even 60s hippie movement are just a few options. Take a trip to a local ballroom-dance club or hit a few wineries for a fun-filled and memorable afternoon. This idea works well as a special Red Hat outing and can include a stop at the guest of honor’s favorite restaurant. Select a bus with a professional audio and video system as karaoke can be a hit with these themes too.